What-It-Is Projects is proud to announce it’s participation in Aqua Art Miami 2011 in concurrence with Art Basel Miami Beach. What-It-Is is a project space and exhibition venue initiated by Tom Burtonwood and Holly Holmes, and operated out of their home in the Chicagoan suburb of Oak Park. Artists are invited to create unique and temporary art works in the domestic setting, which is open to the public by appointment. In addition to this, What-It-Is publishes artist’s books and produces limited editions, as well as participating in international art fairs as an expansion of the project space. So far, What-It-Is has presented projects at the inaugural MDW Fair in Chicago, the NEXT Art Fair, also in Chicago (2010/2011), Fountain Art Fair in NY (2011) and Verge art Fair in Miami (2010). From Sabina Ott’s hallucinatory west coast sensibility, to Andrew Rigsby’s kaleidoscopic dreamscapes, Holly Holmes playful constellations, Tom Burtonwood’s geometric permutations, Lise Haller Baggesen’s teenage Riot and Stoic Swine’s dark secrets; the show offers a variety of media, unified by a bold yet refined palette. 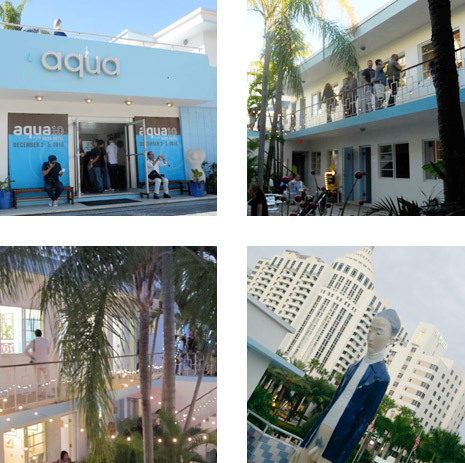 Each artist will exhibit one major work / installation as well as a limited edition artwork produced specifically for the event of the Aqua Art Fair.